How to inoculate Gaharu for its valuable resin? Inoculation is a method was developed to induce the production of gaharu in young plantation trees. The trees are wounded or inoculated in a specific manner and the gaharu production as the natural defence response is supported by applying specific treatments. This method can ensure the sustainable production of gaharu in plantation trees. 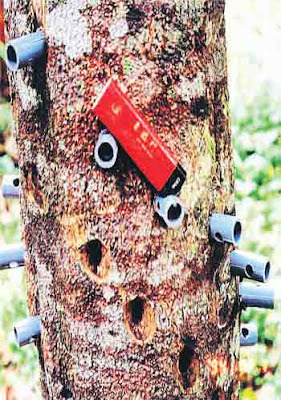 Produced only by “sick” trees infected by fungi, this highly sought after fragrant resin has a cohort of uses, from aromatherapy to spa baths, decorative furniture, perfume, chopsticks, weapon holders, massage oil, joss sticks and items of medicinal value. After four to six years, upon maturing, the trees will be injected with fungal pathogens to trigger gaharu production, and this can be harvested after five months to a year.